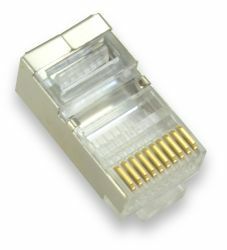 Build your own cables using these RJ50 crimp connectors, which can be used to terminate the end of a cable into a standard RJ50 connector. This connector has 10 conductors and is shielded. A crimp tool is required to crimp the connector onto the wire.